For a second consecutive year the combined impact of adverse weather, lack of timely availability of inputs and severe economic constraints in Zimbabwe have induced hardship and food insecurity among both rural and urban populations. National production of main season maize in 2008 is estimated at 575 000 tonnes, some 28 percent lower than the production in 2007 (using the CFSAM estimate of 800 000 tonnes) which in itself was some 44 percent below 2006 government estimate. The Mission estimates the total domestic cereal availability for 2008/09 marketing year at 848 000 tonnes, about 40 percent below last year’s domestic supply. This includes a forecast production of winter wheat and additional production of maize from winter/early, peri-urban/urban and seed crops. Primary factors responsible for this year’s decline, in addition to adverse weather, were untimely delivery of seeds and shortages of fertilizer, deteriorating infrastructure, and most importantly unprofitable prices for most of the GMB controlled crops. A decline in national agricultural production over the last 7-8 years is also due to the structural change. The newly settled farmers cultivate only about half of the prime land allocated to them owing to shortages of tractor/draught power, fuel, and investment in infrastructure/improvements, and absenteeism on the part of some new settler beneficiaries. The large-scale commercial sector now produces less than one-tenth of the maize that it produced in the 1990s. The maize yields of the communal farmers who used to produce the bulk of the crop in the country have also reduced to one-fourth in about 10 years due to the loss of their symbiotic relationship with former large scale commercial agricultural sector and a demise of healthy agro-input industries. With the total utilization of cereals at about 2.080 million tonnes including 1.875 million tonnes for direct human consumption for the projected population of 11.865 million, the resulting cereal import requirement is estimated at 1.232 million tonnes, of which the maize deficit accounts for about one million tonnes. The annual inflation estimated at 355 000 percent for March 2008, the world’s highest level, erodes the purchasing power of households dramatically on a daily basis and greatly limits their access to the meagre supplies available. Given the acute shortage of foreign currency, the dwindling export base, and high prices of maize in the region and internationally, the Mission estimates that total commercial cereal imports could be about 850 000 tonnes, leaving an uncovered deficit of about 380 000 tonnes of maize. The Mission estimates that 2.04 million people in rural and urban areas will be food insecure between July and September 2008, rising to 3.8 million people between October and peaking to about 5.1 million at the height of the hungry season between January and March 2009. The food insecure population will require food assistance amounting to some 395 000 tonnes of cereals in 2008/09. Additional foods such as oil and legumes, as well as supplementary foods will also be required to augment the higher needs of most vulnerable groups. The market availability of cereals for households that have purchasing power will be crucial to avoid more people becoming food insecure due to scarcity and higher food prices that could result from such scarcity. In view of the GMB’s limited capacity, the Mission further recommends that trading in cereals should be opened up to private traders to ensure that cereals can be imported and moved quickly to areas of need. The Mission also recommends emergency assistance by the Government and the international community to supply timely and quality seed and fertilizer, and dipping chemicals for the control of tick-borne livestock diseases. Appropriate varieties of maize and small-grain seed also need to be sourced urgently for delivery in September 2008. Promotion of locally grown open pollinated variety seed and use of manure instead of imported chemical fertilizers needs to be considered. To deal with the structural food deficit and chronic shortage, it is recommended that the international community and the Government enter into a policy dialogue to mobilize the economic and other assistance needed to promote sustainable food production and overall food security by way of development assistance for investment in farm mechanization and infrastructure (tractor availability, rehabilitation of irrigation facilities, etc.) to enhance productivity and allow fuller capacity utilization by the newly settled farmers. The Mission also supports reforms of the grain marketing system in line with the economic liberalization policy goal announced by the Governor of the Reserve Bank of Zimbabwe in April 2007, in order to protect farmers with minimum support prices and to allow private sector participation in the grain marketing system. Zimbabwe experienced incessant rains in the first half of the 2007/08 cropping season during December-January causing severe water logging followed by prolonged dry spells, through much of the country compounding the devastating effects of a decade-long economic decline. Against this backdrop an FAO/WFP Crop and Food Supply Assessment Mission (CFSAM) was invited by the Government. The Mission visited the country from 29 April to 23 May 2008 to carry out an independent assessment of the 2008 production of the main cereals, assess the overall food security situation and determine the food import requirement, including food assistance needs, for the current marketing year 2008/09 (April/March). The primary purpose of a CFSAM is to provide an accurate picture of the extent and severity of crisis-induced food insecurity, existing or expected, in the country (or in specific areas) so that timely and appropriate actions can be taken by the government and the international community to minimize the impact of the crisis on affected populations. In Harare, the Mission held meetings with the Ministry of Agriculture and Rural Development (MoA), UNDP Resident Coordinator, FAO Representative and FAO technical staff, WFP’s Acting Country Director and other staff, World Bank, UNICEF, UNAIDS, UNFPA, IOM, Department of Social Welfare (Ministry of Planning and Social Welfare), Grain Marketing Board (GMB), Zimbabwe Meteorological Department, Central Statistics Office (CSO), Ministry of Health, Zimbabwe Food and Nutrition Council (ZFNC), Commercial Farmers Union (CFU), Zimbabwe Farmers Union (ZFU), and some of the international and national NGOs. The Mission benefited from valuable inputs from these meetings. In the field, the Mission was assisted and guided by senior specialists from the Department of Agricultural Research and Extension (Agritex) and other staff of MoA, the GMB, Department of Meteorology and Ministry of Planning and Social Welfare, along with four FAO and two WFP staff members from the country offices. An observer from FEWSNet also participated in the Mission. The Mission, divided itself into four teams, travelled to all eight rural provinces covering a total of 28 out of the country’s 58 rural districts over 8-9 day period. The districts to be visited were carefully selected using a range of criteria including the overall productivity, agro-ecological zones, and livelihood/vulnerability considerations. In each province and district, the teams met with administrative authorities including the Governor of the Province and Agritex officials. After these meetings, the teams travelled to different parts (wards) of the selected district covering different farming sectors (communal, A1, A2, Old Resettlement, Small Scale and Large Scale). Brief observations on urban and peri-urban plots of crops were made in Harare and Bulawayo. The Mission also visited markets and interviewed some petty traders. The Mission also relied heavily on the remote sensing analysis and data on rainfall (in particular the satellite-based dekadal estimated rainfall for the current season, the last season and the long term average for each district), vegetation indices (NDVIs) and various interim assessment reports. The Mission had access to the Agritex’s own post-planting area assessment carried out in the first week of February and the pre-harvest crop assessment carried out during the second week of April. This information was used as the basis for verification. Livestock conditions were observed and investigated en route and in the districts visited. Field assessments were made regarding household’s food production, food security, vulnerability, coping mechanisms and social welfare programmes following the “triangulation” methodology described in the revised CFSAM Guidelines1. The crop production and vulnerability situations this year were compared with previous years to get a relative historical perspective. Data and information received from secondary sources were reviewed against data, information and insights obtained during field visits in arriving at the estimates made by the Mission. The Mission used national, provincial and district production data and combined this with information obtained from household and focus-group discussions. Potential income from cash crop and livestock production/sales was used to draw conclusions about the status of food security and the corresponding impacts of the production failure. The results of this Mission are described in the following sections and are summarised in the Highlights above. The Zimbabwe Population Census records the 2002 total national population at 11.635 million as of 18 August 2002. The CSO projection for 2007 had put population at 11.83 million with implicit year-on-year growth rate of 0.3 percent for 2006 and 2007. The growth rate presumably reflected the high deaths due to HIV/AIDS under fertility/mortality assumptions 1 and 2 used by CSO for projections. Using this same growth rate the projected population for 2008 would be 11.865 million. However, CSO has recently revised the total population estimate for 2008 upwards to 12.1 million. No clear explanation was available for this but presumably this could be based on the Assumption 3 reflecting lower death rate under the HIV/AIDS scenario and consequently using a higher growth rate (1.1 percent) since 2002. It is true that published sources indicate the lowering of new HIV/AIDS infections and prevalence rates (see further details in section 6.2). However, the 2006 Demographic and Health Survey found that the death rates in 2005/06 were the highest compared to any period in the past. Therefore, it is unlikely that the reduced HIV/AIDS prevalence would result in a significantly lower death rate this early. The second factor related to population is out-migration. Reportedly there has been a significant amount of out-migration from Zimbabwe particularly into South Africa and overseas for the last five years. However no reliable statistics on this are available. One study which was undertaken by the International Organization for Migration (IOM) indicated that at Beitbridge, one border crossing with South Africa, some 200 000 persons were deported back from South Africa and were registered and assisted by IOM over a two-year period. It is common knowledge that those who are deported are a small fraction of those who actually cross the border. It is perceivable, therefore, that since 2002, the total out-flow to South Africa and other countries could be significant. This points to a lower population figure than the revised 2008 CSO estimate. Thirdly, it is understood that some of the major international organizations in the country, the World Bank for example, use the population estimate of 11 million as a planning figure. So, in conclusion the true population of the country perhaps lies somewhere between 11 to 12 million. On the balance of the above discussion the Mission decided to use the 11.865 million, which is based on the official projections up until last year, as the most likely scenarios for total population. It should be noted that CSO has carried out an inter-census survey in August 2007 but the results are not yet published and were not available to the Mission. Therefore, when the results of this assessment are available a revised food balance sheet may need to be prepared to reflect more accurately the population, food consumption and import levels. Using the CSO proportions, some 8.183 million or 69 percent of the population is estimated to be as rural and the remaining 3.682 million as urban. Economy – Economic decline in Zimbabwe continues as 2008 becomes the tenth year in a row of negative growth in the country’s real gross domestic product (see Table 1). The economy has shrunk by about 44 percent between 1998 and 2007. For agriculture, with an estimated significant drop in cereal production, 2008 may turn out to be one of the worst years since 1992. The key economic indicators since 2001 paint a picture of rampant unemployment and under-employment, with the urban situation becoming especially serious in recent years. Even before the 2002 crop loss, 75 percent of the country’s population was classified as poor and about 42 percent as very poor. The poverty situation has become worse in view of the consecutive depressed harvests and a phenomenal rise in the cost of living. The poor include the rural population of communal farmers, most of the informal sector workers, former farm workers and the urban unemployed. Successively reduced harvests and shrinking economic output have severely constrained the people’s coping mechanisms. Inflation figures are shocking every time they are announced as they reach a new high every month. In January 2006 the consumer price inflation was measured at 613 percent; by March 2008, it reached a new record of 355 000 percent, making this the world’s highest rate of inflation. To achieve this annual rate, most prices would have to double every 20 days. From the mission’s anecdotal evidence they were doubling sooner than this, implying that the actual inflation could be much higher. Food price inflation has been greater than the non-food inflation since May 2007. In the shops prices are upgraded daily or sometimes twice in a day. A rise in salaries, obviously lags way behind the price rises, consequently eroding the purchasing power of incomes. The monthly salary of a teacher, for example, is about USD 5 when the transport cost to work alone can be a significant part of that. The wages offered by farmers to workers are often not enough to cover the worker’s minimum consumption needs. This has in some instances led to farm workers preferring to engage in gold panning (which is illegal) instead, or in petty trade. The authorities have abandoned setting the minimum wage, as it would need to be revised regularly. To deal with rampant inflation, a policy of wage-price controls was announced in April 2007 in a statement from the Reserve Bank of Zimbabwe; however, this was later abandoned or proven largely ineffective. The exchange rate story mirrors that of inflation. The Zimbabwe dollar was redenominated in August 2006 when the currency was devalued by 60 percent, three zeros were removed from the currency and the new official exchange rate with the US Dollar was set at 250:1. The parallel market exchange rate quickly went up to 1 500 in the same month and to about 30 000 by mid-May 2007. This year when the Mission arrived in the country on 28 April the US dollar rate was about 100 million. On the day the Mission left the country on 23 May 2008, the rate was above 400 million. The rate had quadrupled in less than a month. The official exchange rate until recently was ZWD 30 000 to one US dollar. The anomaly had exacerbated the hard-currency shortages in the official system as much of the foreign exchange found its way into the parallel market. The new monetary policy announced on 30 April 2008 now allows a daily floating inter-bank exchange rate in the hopes of bringing back the hard currency into the formal economy. Unintentionally this has created a race between the rates offered in the formal sector (by banks) and the informal sector. The impact of this on the original objective is yet to be seen. Exchange rate - ZWD/USD 3/ -- -- -- -- -- 250 30 000 250 mill. 3/ In August 2006 when a new currency was announced basically removing three zeros from the old currency; rates for 2007 and 2008 are at mid-May point, collected by CFSAM from the parallel market. 5/ First quarter total exports were at USD 431 million, about 8.7 percent lower than the same quarter in 2007. 6/ Due to the estimated higher maize deficit to be met by increased imports. Sources: CSO; Economists Intelligence Unit; RBZ and CFSAM. External trade and food import potential: The declining trend in total exports (which comprise mainly of tobacco, sugar, horticultural products, platinum, gold and diamonds) and the rising value of imports (fuel, electricity, food, chemicals, etc.) have led to an increased trade deficit. The trade deficit obviously cannot be used to acquire imports indefinitely without having the means to cover them. Hence imports of consumer goods have been reduced almost to a trickle and the economy is ravaged due to shortages of fuel, electricity, fertilizer and spare parts for machinery and irrigation equipment. Production of tobacco was slightly better in 2007 after reaching an all-time low in 2006 but is estimated to decline in 2008 again. The sugar sector has performed poorly. Thus, the prospects for 2008 exports are not very good. The first quarter exports at USD 431 million were estimated to be some 9 percent lower than the year before (RBZ). This and the current year’s food crisis, leading to a higher food import bill, are expected to stretch the limits of the country’s economic wellbeing. Specific implications to food imports are discussed later in this report (section 5). Agriculture is the mainstay of the national economy. Agriculture accounts for between 15 and 20 percent of GDP but a majority of the country’s population is engaged in this sector. It generates a large proportion of foreign exchange earnings, although the share of agricultural exports in the country’s total exports has come down from 39 percent in 2000 to 13 percent in 2007 (see Table 1). Zimbabwe’s land is divided into five natural regions on the basis of soil type and climatic factors (see Map 1 Section 6.3). Natural regions I, II and III are suitable for intensive crop cultivation and livestock raising, while regions IV and V offer limited scope for crop agriculture but are suitable for livestock raising on a large scale. The bulk of Mashonalands (West, East and Central), Midlands and Manicaland Provinces are under regions I, II and III, while Matabeleland (North and South) and Masvingo Provinces are under natural regions IV and V. The three Mashonaland Provinces constitute the breadbasket of the country. Zimbabwe’s farming sector can produce, and has produced in the past, exportable surpluses of maize and certain other food crops. But, as described earlier, severe constraints on prime land utilization have resulted in less than full capacity utilization of its natural resources. Agricultural policy: A strong negative trend in the national maize production, which accounts for the major part of food production, over the last 15 years is evident (see Figure 1). A more recent (since 2000) decline is partly due to the structural change precipitated by land tenure changes and partly due to the overriding economic deterioration and reduced profitability of maize production. The newly settled farmers cultivate only about 30 to 55 percent (CFSAM 2007) of the total arable land allocated to them owing to shortages of tractor/draught power, fuel, and investment in infrastructure/improvements and absenteeism on the part of some new settler beneficiaries. Following the land reform programme, the large-scale commercial sector now produces less than one-tenth of the maize that it produced in the 1990s. The reasons for the downward trend before the land reform include a gradual switch by the large-scale commercial farms from maize which became a GMB-controlled crop to other non-controlled crops such as tobacco, cotton, wheat and others. Some experts also argue that the environmental factors such as increased frequency of drought, combined with maize production being on more marginal lands of the communal farms, can explain some of the long-term negative trends. Source: For 1993-2006 CSO; for 2007 and 2008 CFSAM Mission, no provincial figures were available from CSO for 2007. The current agricultural marketing policies have adversely affected the production of maize, wheat and other controlled crops due to unintended market distortions. There seems to be little incentive for farmers to produce beyond their subsistence needs, given the lack of alternative marketing channels and price controls with inflexible procurement prices in an environment of hyperinflation. The Grain Marketing Board (GMB), a Government monopoly agency, buys and sells major cereals at controlled prices (further details on this are given in Section 4 on Markets). The macroeconomic policies aimed at improving productivity of the agriculture sector include providing additional funds for productivity improvement, farm mechanization, irrigation rehabilitation, importation of seed and fertilizer, among others. However, in practice the effectiveness of this programme has been doubtful. By the Government’s own admission, the “advice [of the Monetary Authorities] has disappointingly been met with fierce criticism and even derision here at home.” (Monetary Policy Statement, 30 April 2008, page 8). In the same Monetary Statement, GMB has been cited as being unable to deal with price distortions especially for maize, wheat and fertilizers. To this end, a monetary policy statement made by the Governor of the Reserve Bank of Zimbabwe on 26 April 2007 – “As Monetary Authorities, we wish to re-assure the financial and other sectors of the economy that, as stated before, we remain committed to the nurturing, propagation and speeded gravitation towards a market-based economy as the guiding ideology of our landscape” - is a welcome one but, so far, it is yet to lead to real liberalization of the agricultural sector. Land distribution in Zimbabwe since independence in 1980 remained highly skewed. A land reform programme was initiated following independence to increase access of the indigenous people to land. The first phase covered the period 1980 to 1998; during which 3.5 million hectares of large-scale commercial farm land were acquired and 71 000 indigenous families were resettled on those lands. The second phase was initiated in 1998, but only a small area of 0.17 million hectares was acquired and 4 697 families were resettled. According to Commercial Farmers Union data for 1995, the average size of large-scale commercial farms (4 700 in total) was 3 000 ha as opposed to less than 30 ha for the communal and resettled area farms (862 000 in total). In fact communal farmers then and even now have an average land holding of about a hectare. Large-scale commercial farms being highly capital intensive and dependent on relatively low wage labour force (on average 40 workers per farm) contributed 80 percent of the national agricultural output. In July 2000, the “Fast Track” resettlement phase was launched to speed up land acquisition and resettlement. A law was enacted for the purpose, with compulsory acquisition and resettlement being the key focus. With the ongoing land reform programme, only about 300 or so large-scale commercial farms remain now, most of them not making any new investments and improvements. Since 2001 the former large-scale farms have been converted into A1 model farms (small subsistence farmers) and A2 model farms (commercial medium and large farmers). Many of these A1 and A2 farmers lack access to capital and other inputs, contributing to severe under-utilization of land resource (see Table 2) and low production. Also, there has been a significant decline in the national dairy and export beef herds. Source: information provided by Agritex (formerly AREX). The 2007/08 rainfall season started around mid November and farmers started planting, using the effective rains during the third dekad of the month. The rainfall at the beginning was very favourable. However, there were heavy downpours covering the whole month of December which continued well into January. This has resulted in widespread delay of field operations due to water logging of crops and flooding of agricultural lands. The flooding was serious in that some crops in the low-lying areas were fully submerged for up to 30 days or more. Well above-normal rainfall was received in December 2007 and in January 2008. The second half of the season, covering the period from the beginning of February, was characterized by extremely dry conditions. Meanwhile the expected recovery of crop plants right after the discontinuation of the rain did not bring much of the desired change due to the internal damage caused by water logging. The intermittent rains in March in many areas of the country did little for the damaged crops to be productive again. As a result, the beginning of the dry spell from the end of January or beginning of February effectively marked the end of the 2007/08 cropping season for most parts of the country. However, depending on the soil type, there were some areas where the late-planted crops benefited from the late rains. In general, despite the above-average rainfall received during the cropping season, the distribution was found to be very poor with heavy downpours in a short period of time, during the first half and continuously dry conditions in the second half of the season. The dekadal estimated rainfall pattern for the 2007/08 season, in comparison with the previous year and the long-term average in selected districts from the north, central and south is shown in Figure 2. The dekadal estimated rainfall pattern for the 2007/08 season, in comparison with the previous year and the long-term average in selected districts from the north, central and south is shown in Figure 2. The excessive rain did not only disrupt land preparation, weeding and application of fertilizers but also excessive nutrient leaching. In many of the visited areas, farmers and extension agents indicated that fields were inundated and fully covered by water for up to 30 days. As also indicated by farmers many of the Meteorological Stations have recorded only few non-rainy days in December, which greatly prevented weeding and other field management and cultural practices. In areas, where flooding was not clearly observed, the soil profiles were fully saturated, resulting in suffocation of plants and causing deleterious effects to crop plants. The excess moisture stress affects root development, causes diseases, excessive leaching of nutrients and stunting in growth. In sloppy areas where localized flooding is not serious, there were erosion problems and seeds were washed away soon after planting. The delayed supply of inputs was one of the major factors that affected the productivity of the 2007/08 crops. For example, the bulk of the seed was distributed from mid-December to early January. The bulk of inputs particularly maize seeds and fertilizers were supplied through Government programmes which were implemented by Operation Maguta/Inala and the GMB. Inputs were also availed through the contract programme, NGOs and individual farmer purchases. About 41 590 tonnes of maize seed were availed for the 2007/08 cropping season from various sources, which covered 1 633 640 ha out of the total 1 722 322 ha planted. Of this some 26 791 tonnes were adequate to cover 1 071 640 ha of the area under maize which were provided by Operation Maguta, GMB and NGOs for the season. The remaining 650 683 ha was planted using retained seeds, carryover seeds and seeds from other sources. To overcome this problem, farmers and field staff have requested that seeds should be accessed directly from the open market. The unutilized seeds are being kept by farmers for the next season. Unavailability of adaptable local and open pollinated varieties (OPVs) in the hands of farmers for opportunity cropping and as an alternative to hybrid seeds, has remained to be one of the critical issues in relation to effective utilization of planting times and the early rains. As indicated by almost all of the visited farmers and agricultural extension workers, the main reason for the untimely planting of seeds was attributed to the difficulty of accessing the required seeds at the right time of planting. Hence they have requested that the necessary seeds should be easily accessed (sold) in the open markets so that farmers can buy them ahead of time for planting and thereby plant as soon as effective rains are received. Although small in number, those farmers who obtained seeds on time from other sources such as NGOs and black markets succeeded in getting reasonable harvests. In this regard, the effect of planting time on the overall productivity of crop plants particularly maize cannot be understated. With regards to small grains, certified seeds of groundnuts and soybeans were also generally inadequate for the season. As a result, some farmers received pure grain as seed, and some used retained seed, which compromised germination rates and low productivity of the crops. The supply of fertilizers for the summer cropping season was critically below the demand of farmers. Only 7 percent of the targeted 600 000 tonnes of the basal fertiliser and 10 percent of the required 400 000 tonnes of top dressing fertilisers reached the farmers on time. Inputs for cotton and tobacco were supplied by the contractors, though in some instances, cotton input packages were incomplete without either the chemicals or fertilisers. Consequently, most of the 2007/08 crops suffered severely from nutrient deficiency caused by inadequate distribution of fertilizers. A total of 232 000 households received seeds and fertilizer assistance from about 20 NGOs during the 2007/08 cropping season, through direct distribution, seed fairs and voucher programmes. An additional 50 000 households were assisted with conservation agriculture interventions. The season was also characterized by high shortage of labour for farming operations especially in relatively high production areas (for example in the Mashonaland provinces), mainly due to the unattractiveness of wages to the labourers. Farmers found it extremely difficult to attract enough labour at critical times. In most cases, farm workers were not willing to accept cash as payment for their labour. The labourers rather preferred to be paid in-kind with basic commodities that were not readily available. Similarly, inadequacy of fuel supply resulted in slow progress of the land preparation before the onset of the rains and hence resulted in the ineffective execution of various farm operations that depend on diesel-operated farm machinery and equipment. Due to the lack of tillage power (either oxen or mechanical) a small window of opportunity for critical operations cannot be availed of. Last year, the Government undertook the farm mechanization programme under which the following machinery and equipment were distributed on credit - some 2 725 tractors, 105 combine harvesters and other equipment. However, these are considered to be vastly inadequate as compared to the requirement level. Agricultural credit was generally inadequate, and the high levels of inflation significantly eroded the value of the limited loans. Farmers have requested an easy and year round access to credit. There were no major outbreaks of pests during the cropping season. Minimal or insignificant damages were caused due to common pests including stalk borers, army worms, aphids and boll worms. However, the crops were highly infested with weeds due to the effect of high rainfall. Farmers in many areas were not able to go into their fields due to the continuous rains, and were not able to undertake the required weeding and other cultural practices. Due to the high irregularity of the season’s rainfall, the 2007/08 crops were planted in three different periods. The earliest planting was at the end of November (about 14 percent of the total maize area), then those planted in December during the wet period (about 43 percent) and finally at the end of the wet period (after December, another 43 percent). The early-planted crops performed well while the December crops suffered from excess moisture stress that affected germination and emergence of seeds. The excess rains brought about water logging problems resulting in loss of nutrients and high weed infestations. The late-planted crops were affected by prolonged dry spells, particularly in February and onwards. Considering the fact that only 14 percent of the maize seeds were planted at the right time of the season, the effect of planting time on the overall production in the country is apparent. The delayed planting of crops was also aggravated by shortage of machinery and tilling equipment, as well as limited supply of fuel. There was also a problem of shortage of spare parts, which hindered the timely execution of farming operations. While the overall area covered by maize has increased compared to last season, there was a notable shift to the growing of groundnuts, sweet potatoes, sorghum and other cereals. The relative increase in the growing of sweet potatoes and groundnuts was attributed to the shortage and soaring prices of bread and cooking oil in the market. Sweet potato is one of the drought-tolerant crops adaptable to many of the communal areas where the rainfall is unreliable. There was also a minimal shift to the growing of cotton and tobacco due to the higher returns last year. The relative shift to cotton, soybeans and groundnuts is partly attributed to the low incentives for growing maize. Therefore, the producer price of maize should be constantly reviewed in line with the prevailing rate of inflation, so that the production levels are maintained. Yield is a function of several factors, and moisture stress is one of the main factors that affects the productivity of crop plants. Moisture stress can be caused by either excess or deficiency of water, both of which were severely manifested during the 2007/08 cropping season. Lower yields are obtained due the erratic rains resulting in stunting of plants at vegetative and reproductive stages of growth. These were related to ineffective grain-filling in cereals and pod formation in legumes, abortion of flowers and poor boll formation in cotton. Maize is one of the susceptible crop species to water logging, which severely affects plants by reducing the uptake of nutrients (including water), Nitrogen, Phosphorus and Potassium. In some situations, hormone imbalances and soil-borne pathogens (diseases) have also been shown to be important factors. Increase in the duration of flooding or a decrease in the age of the crop at the time of flooding, both increase the yield loss. Individual crop yields were built-up from the district level Agritex data by the farming sector. Final yield estimates were based on the farm interviews, actual crop cutting experiments where crop was still standing and examination of the maize cobs in the drying bins. Then each farm was compared to other farms in the locality. Sharing this information with all team members including Agritex officers and examining the rainfall distribution charts, each district level yields were adjusted with a consensus in most cases. Based on this, the national average yield of the main staple crop, maize, is expected to decrease from about 0.49 t/ha in 2006/07 to 0.33 t/ha during the 2007/08 cropping season (Table 3). The yield reductions in drought conditions occur when there is shortage of moisture at the critical stage of flowering and growth. Similarly, the productivity of sorghum, millet and finger millet as well as most other crops will be lower than that of last year. The lowest maize yields for the current season are obtained from Matabeleland South (0.10 t/ha) and Matabeleland North (0.11 t/ha), while the highest yields come from Mashonaland Central (0.69 t/ha) and Mashonaland West (0.60 t/ha) provinces. It was noted that the practice of conservation agriculture has shown a considerable benefit over that of the conventional agricultural practices, despite the small number of farmers involved in it. As part of the overall extension programme, the practice of conservation farming and Sustainable Land Management (SLM) needs to be extended to the vast majority of the farming communities. The Mission noted that over the last 4 years, conservation agriculture activities (provision of inputs, training and extension) have increased in magnitude and geographical coverage. On the whole, the assistance provided covered a good portion of the country (ACWG, Feb 2008). The total area planted with various summer crops in 2007/08 is higher than that of the previous season. Table 3 shows the summary of area, yield and production of main cereals in comparison to 2006/07. Since there was no province level data from CSO this year, the Mission used the CFSAM 2007 estimates of production and area (the area planted used in that report was that of the Agritex). Despite the increased area coverage, the total production and yields of maize, sorghum and several other crops were lower than the previous season. This was mainly attributed to several factors including the erratic rainfall and delayed supply of inputs, particularly seeds and fertilizers. The continuous decline of maize productivity per unit area, in recent years, has been exacerbated by late arrival of seeds to the farmer, resulting in late plantings, and shortage of fertilisers at the time of planting. 1/ Since provincial breakdown of production was available from CSO, CFSAM 2007 estimates are used which were based on Agritex’s area planted. 2/ According to FEWSNet (Dec. 2007) urban agriculture contributes significantly to cereal needs for urban households, particularly in towns and cities located in areas of high agricultural potential. Here a conservative estimate by CFSAM based on discussions with experts and assumptions that on average one-third of the peri-urban/urban households posses a 10x10 meter garden yielding about 3 tonnes per ha is made. Note: Calculations computed from unrounded data. Table 3 shows that the area planted to maize compares favourably with the trend in the last few years. Generally, there has been an increase in area planted whilst yields continued to decrease. The greatest reduction in yields was experienced in the communal sector. The area planted to maize by the communal sector constitutes about 60 percent (1 024 000 ha) of the total area planted to maize during the 2007/08 summer season (see Table 5). This sector, however contributes to only 21 percent of the 2007/08 maize production. During the second half of the 1990s, the communal area sector used to contribute to about 80 percent of the total summer harvest. 1/ Including provincial totals of maize, sorghum, pearl millet and finger millet. As shown in Table 6, a total of 61622 ha flue-cured tobacco was planted in 2007/08, compared to 52 592 ha of the previous season. The estimated total production for the 2007/08 season is 69 790 tonnes, with an average yield of 1.1 t/ha. Mashonaland Central and Mashonaland West are the two main tobacco producing provinces of the country. Similarly, there has been a marked increase in the planted area of cotton and the number of contractors for cotton has increased compared to that of last year. The relatively more attractive prices offered to farmers is the main reason for the increasing trend in tobacco and cotton in recent years. However, the erratic rains of the 2007/08 have caused moisture stress, which affected the productivity of both crops. Sources: 1999/00 – 2006/07 CSO; 2007/08 Agritex. Wheat is the main winter-season crop and 95 percent of it used to be grown on large-scale commercial farms having access to irrigation. Now most of the wheat growers are A2 and A1 farmers. Very few large- scale commercial farmers are involved in irrigated wheat production. Prospects for winter wheat this year do not look good due to the principal constraints of insufficient and irregular supply of electricity for irrigation, and shortages of fertilizer, fuel and credit. In some areas, the summer soybean crop, which has to pave the way for the winter crops, is still in the field due to shortage of fuel for harvesting. The final recommended date for sowing wheat is 31 May, but by mid-May only about 5 000 ha had been sown. These constraints are expected to reduce the area under wheat drastically by about 50 percent compared with last year, and also produce low yields giving a production forecast of about 75 000 tonnes, half of the level last year. The area under barley, which is produced under contract to breweries, may go up slightly from last year’s level of about 10 000 ha because of the strong demand from the companies. The barley crop is primarily used in the commercial brewing process. There is some winter or early maize production in the country. According to the Agricultural Coordination Working Group (May 2008) about 11 430 ha have been identified for the 2008 winter and early maize production and of this 8 930 ha has been earmarked for commercial maize production. Table 7. Wheat production trends from 1996–2007 and forecast for 2008.
a/ Of which deliveries to GMB for past three years have been slightly over 50 percent. Sources: 1996-2007 CSO; 2008 CFSAM. The livestock condition in the vast majority of the country ranges from fair to good. There was adequate water and better pasture conditions due to high rainfall quantities. The main sources of water for the livestock are rivers, dams, weirs and boreholes and the current levels are adequate throughout the country due to the relatively higher quantities of rainfall received during the season. However, some pocket areas of communal areas may face water scarcity that is normal during the late seasons, and are not specific to the current season. In general the communal areas were overstocked and grazed. In some areas, farmers are taking advantage of the abundant grass to make hay for the dry season, and fire guards to protect the veldt were very limited. On the other hand, there is a shortage of feed (concentrate) in the country similar to the past few years. The availability of feed depends on the performance of the cropping season and availability of the ingredients. The main ingredients used in the preparation of feed include maize, cottonseed, sunflower and soybeans, which are in short supply due to the general food shortage problem in the country. Smallholders now own more than 90 percent of cattle in Zimbabwe. As indicated in Table 8, the numbers of cattle, sheep and goats in this sector have fallen in recent years, while the pig population has increased slightly. 1/ Similar data for 2007 was not available to the Mission. There has been a dramatic decline in the number of pedigree cattle over the last seven years. In 2000, the commercial beef herd on large-scale commercial farms numbered 1.66 million head. With the fast tracking of the land-reform programme in 2000, farmers began slaughtering their cattle when their farms were allocated for resettlement. By 2002 the number had fallen to about 5 000. The dairy herd has seen a similar decline, with prime dairy cows being slaughtered for meat, and milk supplies continuing to fall. With regard to animal health condition, there is high prevalence of tick borne diseases, lumpy skin disease and foot rot. This was exacerbated by a critical shortage and high prices of essential veterinary drugs and vaccines. The major constraints in terms of animal health are inadequate and expensive medicines and chemicals. This, in particular, is serious on dipping of livestock due to unavailability of dipping chemicals. Lumpy skin and tick borne diseases are widespread. Prices of maize along with several other key commodities are controlled by GMB by setting the buying price for farmers and the selling price for millers (and their price of maize meal to consumers), for vulnerable groups and other commercial users (mostly as animal feed). Maize is, however, traded in small quantities by farmers (so called “farmer-to-farmer” sales) and petty traders at open, but usually hidden, markets. As shown in Figure 3, the GMB procurement price, which is uniform across the country, has increased in discrete steps and has generally remained well below the parallel market retail price. The GMB maize purchase price when announced in October 2007 was ZWD 10 million/tonne, or equivalent to about USD 10 per tonne at the parallel market exchange rate, but reached about USD 1 in a few months. For the 2007/08 season the producer price for wheat was ZWD 71 250 000. The last price of maize announced in April 2008 was ZWD 22 billion/tonne, equivalent to about USD 220 (at the parallel market exchange rate), almost equal to the international price when it was announced. But within weeks the declining currency had eroded the value and by mid-May it was about one-fourth of that. Bonuses are often offered to top-up on an ad hoc basis but usually the payments are late or sometimes uncertain. Thus these prices set by the Government are artificially low and clearly out of step with prices in the informal sector and international price levels and trends. Hence, there has been a shift at least in relative terms towards non-controlled commodities such as cotton, tobacco, sugar beans, barley and sorghum among others mostly on a contract farming basis with the further processing companies and breweries. As shown in Figure 3, prices over time in nominal terms have skyrocketed. For example, the price of maize in Harare went up from ZWD 38 250 per bucket (17.5 kg) in May 2007 to ZWD 550 million in the first week of May 2008. However, when deflated by the CPI, the Harare real price of maize shows that it was quite low during the 2006/07 marketing year corresponding with the good harvest of April 2006. The real price index rose from a low of 29 in February 2007 to a high of 218 in September 2007 as a result of a drought in much of the country. With steady import flows from Malawi and Zambia the real price has been declining since, meaning that the nominal maize prices increased but at a slower rate than the general inflation. Currently the price of maize in the open market is rising rapidly with yet another depressed harvest and could only be kept in check with speedy and substantial imports into the country and subsequent distribution to the food-deficit communities throughout the country. Prices, wages and other market information collected by the CFSAM based on interviews (not actual sales) during field visits 5-10 May 2008 and a comparison with prices one year ago are shown in Appendix 1. Rural labour markets by and large are dysfunctional or largely inefficient for the following reasons. Imperfect information of going wage rates and labour surplus/deficit pockets especially in an escalating inflationary environment. Reduced mobility of labour due to high transport costs and physical separation of surplus areas (generally associated with the communal localities) from the high demand areas (typically in large-scale commercial and A2 farming areas). This results in an extreme variability in wage rates, as illustrated in Appendix 1. There seems to be a low equilibrium trap as far as the labour market is concerned at a very low level of labour use. This is a result of potential employers not being able to afford high wages due to controlled prices of their products and potential labour not willing to accept low wages which can be below the normal cost of living, including transaction costs and especially, the high cost of getting to work. Source: WFP/VAM, Harare, and GMB price converted from price per tonne; USD price based on the parallel market rates. This inefficient functioning of the labour market has led to increased vulnerability especially in the communal areas. Solutions are complex and would require getting the macroeconomic factors including inflation under control, removing economic distortions and increasing production at the farm level. This area, however, is beyond the scope of this Mission. Zimbabwe’s cereal supply/demand balance for the 2008/09 marketing year (April/March) is shown in Table 9 and is based on the cereal production estimates shown above and the following assumptions and justification. Population - As described in Section 2.1, keeping in line with 2007 CSO estimate and the implicit growth rate, the population for 2008 is projected to be 11.865 million. Stocks - The Government stock levels of important cereals as of 1 April 2008 provided by GMB are used in the balance sheet. They are extremely low especially compared to what was projected as the ending stocks last year. This implies a significant stock drawdown during the last marketing year. Given the relatively low production levels this year no major stock build-up is assumed. Privately-held stocks (by farmers and traders) are assumed to be low, given the extreme shortages of maize during the past year. In any case, no significant change in stocks - beginning versus ending - is assumed for all cereals. Human consumption - Per caput cereal consumption of 158 kg per annum, distributed across cereals as -- maize 120 kg, wheat 23 kg, millet and sorghum 13 kg, and rice 2 kg -- is used this year. This is 5 kg less than in the past. Over the last five years the apparent consumption of wheat has gone down significantly. The use of 28 kg per person per annum requirement for 2007/08 resulted in an import requirement for wheat of over 200 000 tonnes. The GMB imports for the year were only 48 000 tonnes, leading to, in retrospect, a sizeable over-estimation of imports and/or unmet consumption of wheat. There is some evidence that other commodities, in particular sweet potatoes, groundnuts and potatoes, may have recovered some of this loss (stated to the Mission as an anecdotal evidence). Hence for this marketing year per capita consumption of wheat is set, which is equal to the five-year average (apparent) consumption at 23 kg. At 158 kg of cereals per caput/annum, about 69 percent of the minimum calorie needs of a person (at 2 100 kcal/day) would be met, on average. The remainder, as usual, is expected to come from other foods such as potatoes, sweet potatoes, beans, groundnuts, meat, poultry, fish, vegetables and wild foods. In 2008/09 there is a large gap between domestic availability and consumption requirements. Feed use - Use of cereals for animal feed is quite limited, given the large and widespread shortages of grains. Moreover, livestock numbers have significantly declined over the past years. However, for the use of dairy cattle and poultry the quantity of maize to be used as feed is required. Thus given the much reduced domestic production and the fact that only a limited amount of maize is likely to be imported for livestock the amount of grain to be used as feed during this marketing year is reduced to 100 000 tonnes from last year’s 150 000 tonnes. Seed use - Hybrid maize seed purchased from seed suppliers and GMB are used almost universally in Zimbabwe. However, when this seed is not available on time many farmers resort to using retained seed. In the balance sheet, similar to past years, seed maize production is included in the total maize supply. Similarly, seed requirements calculated by using the recommended seed rates and forecast area to be planted next year are included in the total utilization. Some 20 percent is added to account for potential replantings. This year, given that the domestic seed production is extremely limited, use of imported seed is implied in the total import requirements in the balance sheet. Post-harvest losses – These are assumed at 5 percent of production for all grains. This is the same rate as the last two years but lower (for maize) than the one used in the 2004 CFSAM report because of the drastic reduction in cereal production during the last two years. It is recognized that the losses at individual farm level vary a great deal depending on the storage conditions but given a significant shortage of the domestic production and much shorter duration of storage this minimal percentage loss is considered appropriate. However, there is a need for a technical study to determine the exact extent of losses under various conditions. Cereal import capacity - The Government has a monopoly on cereal imports, hence much of the imports in Zimbabwe occur through its parastatal, the GMB. The import capacity in Zimbabwe, therefore, is basically determined by the ability of the Government to import (in terms of total export earnings, amount of foreign currency available and/or ability to acquire goods on credit) on one hand, and the willingness to import food by rearranging its priorities for food imports vis-à-vis other imports such as fuel, electricity, chemicals, etc. on the other hand. These factors are discussed below one by one. Prospects for export earnings – The RBZ recently estimated the first quarter exports for 2008 at about USD 431 million, some 9 percent below the same period in 2007. Gold and platinum prices in the international markets are up, but tobacco sales are expected to be down. Thus, the outlook for gross export revenues during 2008/09 is considered not much different than last year. Remittances from abroad, a major source of earnings in foreign currency, seems to be favourable. Remittances are substantial; some estimates are put at about USD 100 million per month. In addition the Government has used deficit financing to the tune of about USD 700 million in 2007. This can be an avenue if foreign loans or on-credit purchases can be managed. Availability of foreign currency – The country’s official foreign exchange reserve position in general is precarious. According to an unofficial estimate, the foreign currency reserves with RBZ are extremely limited, perhaps to the tune of merely USD 10 million with a possible import cover of about 12 days. It is clear that the foreign exchange crisis will persist during 2008/09 as the import demand will continue to be high in view of the need to import large quantities of fuel, electricity, and other essential capital and intermediate goods, in addition to food, and having to make payments on the mounting debt. On 30 April 2008 the RBZ liberalized the currency market by allowing banks to use a floating exchange rate. This policy is aimed at acquiring the foreign currency into the formal sector, away from the parallel market. If successful, this may increase the currency under the control of RBZ to be used on its priority imports. Import priorities and historical import levels- According to the Government statement, maize importation is given a very high priority and with a recent announcement of 600 000 tonnes of maize being bought, GMB is reportedly making preparations to import up to 1 million tonnes. This however, with current high international prices could cost about USD 400 million at an indicative import parity price and would seem an unlikely scenario. The country is dependent on fuel and electricity imports, both increasing in value due to rising international prices. The EIU report estimates the oil import requirement at USD 120 million per month. The Government imported substantial quantities of about 837 000 tonnes of food grains commercially during 2002/03, of which maize accounted for 764 000 tonnes, according to GMB statistics. Since then, commercial imports of maize have varied, with the lowest being 251 000 tonnes in 2006/07 (see historical trend in Figure 4). Sources: For 2001/02 to 2007/08 - Commercial imports from GMB, Food aid from WFP;for 2008/09 CFSAM Mission. Thus, in conclusion, the Mission assumed that the Government should be able to commercially import some of the needed food grains, essentially maize, wheat and rice, in 2008/09 but not all of its requirements. A more likely scenario would be something in the order of 600 000 tonnes of maize and an additional 200 000 tonnes of wheat and rice as formal government imports during 2008/09 marketing year. Cross-border and private imports - An additional, residual amount of 51 000 tonnes of imports of maize, wheat and rice, similar to last year, by individuals and petty traders through informal channels and in-kind remittances, especially from South Africa and possibly from Mozambique and Zambia is feasible. It is noted, however, that last year’s cereal imports across the monitored border posts were extremely small – under 2 000 tonnes. However, many individuals import significant quantities of wheat flour and rice in small amounts. Also, it should be noted, that the “grocery bag” type of imports by individuals is not recorded even at the monitored border posts. Anecdotal evidence of a steady stream of food purchases at the individual level, points to a much higher aggregate amount than what is recorded at selected border posts. It is also noted that in 2003 the Government allowed food imports by the private sector. This included an increase in the quantity of food individuals could import without a permit and duty-free importation of maize and wheat, by licensed traders. Similar policy should be enacted to deal with this year’s food deficit. With the resulting supply/utilization figures presented in Table 9, there remains an uncovered national cereal deficit of about 380 000 tonnes, which may need to be covered by international assistance. Given that large numbers of households in different parts of the country either already do not have or will soon run out of food supplies, and that their coping mechanisms have been severely stressed, or exhausted, this year�s food deficit needs to be addressed adequately and urgently, particularly targeting the most vulnerable people, including households severely impacted by HIV/AIDS, as outlined in the next section. 1/ Although the resulting estimates represent the most likely scenario, given the uncertainty of each parameter in the balance sheet, there may be significant variation in the actual outcome. However, given the size and nature of the sample, showing confidence limits with certain levels of probability is not possible. 2/ Barley production is not included in this food balance sheet since most of it is used for commercial brewing purposes. 3/ Some of this (about 64 000 tonnes) were already delivered in April 2008. With the above supply/utilization figures, there remains an uncovered national cereal deficit of about 380 000 tonnes, which may need to be covered by international assistance. Given that large numbers of households in different parts of the country either already do not have or will soon run out of food supplies, and that their coping mechanisms have been severely stressed, or exhausted, this year’s food deficit needs to be addressed adequately and urgently, particularly targeting the most vulnerable people, including households severely impacted by HIV/AIDS, as outlined in the next section. Household food security is expected to deteriorate significantly during the current marketing year. The trigger is the drastic reduction in food and agricultural production following erratic rainfall and the gross lack of key farming inputs. The situation is compounded by high and rising levels of poverty, unemployment and hyperinflation due to several years of macro-economic instability. The Government’s capacity to import food to satisfy aggregate domestic requirement will be restricted by severe shortages of foreign exchange, which will further restrict household access through markets. The high rates of HIV/AIDS and the deteriorating health-care delivery services provide important backdrop to the unfolding food insecurity. The decline in food production has been unusual, in that the excessive and erratic rainfall was over much of the country in comparison with localized droughts in the past. In addition, this poor production has followed several years of declining production. As a result, most of the households had little food stocks carried over from last year and have been eroding their assets (e.g. livestock) to cope. The Zimbabwe Vulnerability Analysis Committee (ZimVAC) normally carries out a routine detailed annual household vulnerability survey based on a statistical sample. This year’s ZimVAC has been postponed until July. The ZimVAC assessment of May 2006 (a year of relatively good agricultural production) established that some 1.4 million people would not meet their cereal requirements. In 2007, the CFSAM established that about 4.1 million persons were food insecure. 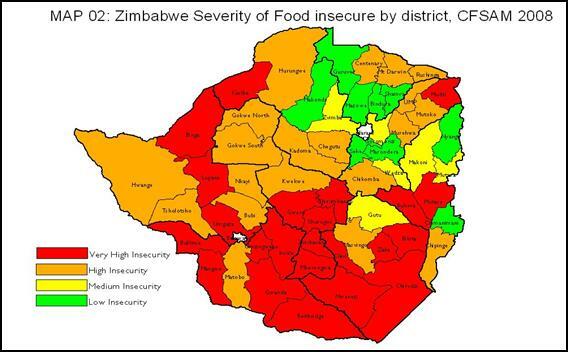 However, the 2007 ZimVAC assessment (a year of poor production) concluded that 600 000 people were food insecure. By contrast, the assessment of 2003 (a year of similar level of production to 2007) concluded that 4.4 million persons (in rural areas) required assistance. Health and nutrition are intricately related to food security by impacting food utilization. But they also affect household food access through their effects on the productive capacity of household members. Discussions with key institutions (Ministry of Health, UNICEF, UNAIDS) suggest that Zimbabwe has a decentralized health system that is well-suited to provide healthcare services countrywide. However, major challenges, in particular, relating to resource (including equipment and medicines) and health professionals, remain. The Zimbabwe Food and Nutrition Council (ZFNC) nutrition assessment of October 2007 found wasting levels of 4.1 percent among children aged 6-59 months; with levels of above 7 percent in 5 districts (Gwanda, Lupane, Umguza, Chipinge and Mbire. The ZNFC also noted declining wasting levels between June 2007 (ZimVAC assessment) and October 2007 in Kariba (from 11 percent to 5 percent) and in Kadoma (from 8 percent to 6 percent) and attributed this to supplementary feeding programmes implemented by the Government. The prevalence of HIVAIDS among pregnant women attending antenatal clinics has declined significantly from 26 percent in 2002 to 18 percent in 2006. The downward trend observed in Zimbabwe is also supported by several studies (including Ministry of Child Welfare Zimbabwe 2007)3. The recent Zimbabwe Demographic Health Survey (ZDHS, 2005-2006) established that nearly one-quarter of a million children under the age of 18 years are orphans, a rise from 9 percent in 1994 to 22 percent. It is also estimated that there are 3 000 deaths per week attributed to HIV/AIDS. The highest prevailing rates are found in Matabeleland South (20.8 percent) and Manicaland (19.7 percent), and it is in these provinces that the impact on the food security situation is highest. The main livelihoods in the different provinces and districts are defined by the agro-ecological zones depicted in Map 1. 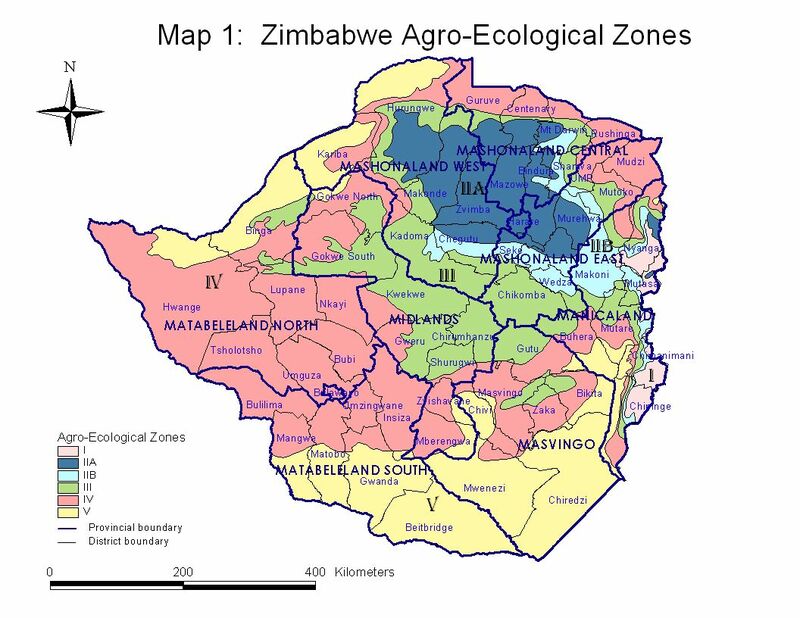 At one extreme, the districts in Matabeleland South fall in agro-ecological Zones IV and V and those in Matabeleland North fall predominantly in Zone IV. Livestock dominates the livelihoods in the two provinces. 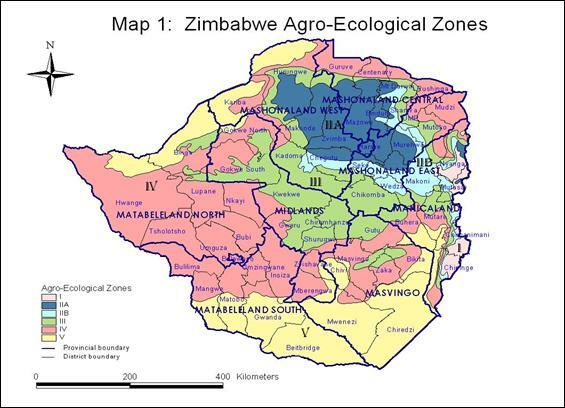 At the other extreme, the Mashonaland Provinces (East, West and Central) have large tracks falling in Zone II (A & B) that are suited to crop production. Manicaland has tracts of Zone I and Zones IIB suited to crop production and patches of Zones III, IV and V that support mixed agricultural production. Masvingo Province shares some characteristics of Matabeleland (Zones IV and V), but with patches of Zone III. Meanwhile Midlands Province lies mainly in Zones III and IV. In general, crop production (food and cash crops), livestock rearing or a combination constitutes the primary livelihoods in the rural provinces. These livelihoods options in turn define most of the secondary livelihoods options – such as employment on commercial farms and game reserves. The existence of mineral deposits and mining in some provinces provide alternative livelihoods and the thrust of coping strategies. These livelihoods and coping strategies are summarized according to province in Appendix 2. They are also discussed in details below and form an important factor in the analysis of the food insecurity situation. About 30 percent of Zimbabwe’s total population lives in urban and peri-urban areas. An estimated 60 percent of this urban population is concentrated in two urban provinces of Harare and Bulawayo. The remaining 40 percent live in the main towns of the rural eight provinces and in peri-urban districts 4. Although the CFSAM did not cover urban areas, it is recognized that the combined record low crop production this year, with hyperinflation, will have serious implications for household food security for this population. The section, therefore, reviews the existing information from recent assessments (including ZimVAC’s 2006 Urban Assessment) to draw some of the implications about food insecurity in urban areas in 2008. It is generally established that urban households purchase most of their food requirements. The findings of a survey carried out by NGO joint initiative in 7 urban areas in 2006 concluded that “seventy-five percent buy the bulk of their food and 65 percent buy most of their fruit and vegetable requirements”. These households are engaged in some form of employment as the primary sources of income to support their food purchases. Unemployment in Zimbabwe stood at about 70 percent in 2006 and this is expected to have deteriorated further, reflecting the trend in the economy. With hyperinflation at 355 000 percent (CSO, March 2008), access to food is increasingly harder for urban households. According to the November 2006 urban assessment by ZimVAC, 64 percent of the households surveyed were involved in ‘urban agriculture’ that contributes to food needs. The poor cereal production in 2008 is likely to affect urban households primarily through the scarcity of food on the markets. Moreover urban agriculture was equally affected as the rest of the country. For rural households, livestock ownership provides a very important hedge against production shortfall and food insecurity. Livestock is an important source of income and coping strategy for households in Matabeleland South districts, and to a lesser extent in the northern half of the country which has mixed production. However, the significant decline in crop production will affect the availability of grains on the market, which in turn is likely to lead to higher food prices and thereby affect the terms of trade that these livestock-owning households will face. In addition, excessive sales of livestock tend to drive down the price of stock and their overall terms of trade. At the time of the Mission, livestock conditions were fair to good and, therefore, livestock-keeping households will have the option to sell stocks to meet food shortfall. Their main challenge will be an adequate availability of grain through GMB sales and informal markets. Households are likely to intensify sale of chickens, goats and cattle to meet their food requirements. Sale of cash crops such as cotton, groundnut, sunflower, sugar beans, watermelon, vegetables, etc. is a normal practice in zones where they are produced. Vegetable production (sugar beans, tomatoes, etc.) was widely reported (especially on irrigation schemes) in many provinces. Petty trading of various types (e.g. consumer goods, mopani worms, re-sale of vegetables, firewood) becomes prominent when the production decline is significant. These were found to be practiced in most of the provinces and district. Roadside resale of vegetables was reported in many districts. The poor economic situation has led to many Zimbabweans going to neighbouring countries for better opportunities. As a result many households, urban and rural, receive remittances from their relatives, mostly from South Africa, Botswana and overseas. Remittances tend to be more prominent in districts along the border with South Africa and Botswana (e.g. in Matabelelands). However, remittances tend to be irregular and benefit a limited number of households. Casual labour is an important coping strategy for households living in close proximity to commercial farms. However, the Mission established that casual labour was unattractive because of low wages. Although officially prohibited, gold panning consistently emerged as a key and important source of income in a number of districts including in Matabeleland and Midlands provinces. Households also employ adverse consumption coping strategies that include: reducing the amount of food, reducing the number of meals (such as going without food for entire day), eating unusual foods (e.g. low value and wild foods) and sending household members to beg. i) the extent of production in the current season (number of deficit months); ii) the proportion of potential food insecure persons in a district (using percent of population in communal areas in the district as proxy); and iii) the extent of food access through coping strategies (index for coping strategies based on number and value of strategies in the province). However, the food security of individual households in any given location will be influenced by an array of factors that condition their access – through their own production or market purchases using cash income (or exchange) earned from agricultural or non-agricultural livelihoods. Past assessments (CFSAM, CHS and ZimVAC) have highlighted factors that affect household access – these include those affected by HIV, household demographics and health and nutrition. The Mission identifies three categories of food security groups: chronically food insecure; transitory food insecure; and food secure, and these are discussed below. These households tend to be food insecure regardless of the performance of the production season and the overall food supply situation. They cannot grow enough of their own food or purchase sufficient food even at regulated prices. These include: elderly-headed households, families hosting disabled, those with high levels of dependents and the destitute who lack any resources. Those who fall within this category are estimated to be 10-15 percent of the rural population (ZimVAC Reports). The ZimVAC Report for 2007 also categorized households headed by females; households without any cattle; households with one of its members chronically ill and households with one of its member disabled to be among the most vulnerable. These households are part of the caseload of the Department for Social Welfare for assistance. During last year’s drought, a Drought Monitoring Committee was established with representation from the district and ward levels. The DMC worked with village leaders to enumerate households for assistance, and this was based on the above categories. These households were intended to be prioritized for GMB grain sales at lower prices. Chronically food-insecure households are targeted for humanitarian assistance programming by government and aid agencies. This category of households is normally food secure but the households do not meet their food needs during certain periods due a number of factors such as erratic rainfall or an usual increase in food prices. In 2008, this group constitutes mostly households that have lost a major proportion of the current season’s production. It includes households with insufficient food access as a result of inadequate physical availability, high food prices and the deterioration of terms of trade. Households with poor access include livestock producers, waged labourers, and former commercial farm workers, now classified as the Mobile Vulnerable Populations (MVP). Despite the poor season, a large proportion of rural households will command adequate food. Many of the households planted early and were able to get a reasonable harvest. Households with livestock and households that have produced cash crops should in general, be able to purchase sufficient quantities of food for the rest of the season, and therefore fall in this group. Some will include households whose production may have failed but will still be in a position to meet their food needs through engaging in or expanding coping strategies. For those in this category who depend on market purchases, adequacy and regularity of GMB sales will be an important determinant of their sustained food security during the season. Continuous monitoring of the grain supply will be important, as some of them could fall into the transitory food insecure category. The food security situation in 2008/09 poses a major challenge to ensuring food availability and the management of programmes addressing needs of the vulnerable households. A key challenge to ensuring food availability on markets for households is the high world market prices, as food will have to be imported. The Grain Marketing Board is the sole trader of grains (maize, sorghum/millet and wheat) in Zimbabwe. Consequently, grain trade is highly regulated and market arbitration of grain movement between surplus and deficit regions does not take place. Instead, GMB established depots to purchase from farmers in surplus areas and to sell to consumers throughout the country. In adverse situations such as the current weather-induced production shortfall, GMB has the responsibility to ensure that food is available to the needy population at affordable prices. During the last marketing season, total GMB purchase of maize amounted to 552 621 tonnes comprising 172 206 tonnes from domestic farmers and 380 415 tonnes of imports from Malawi, Zambia and South Africa. During the same period GMB sold 628 962 tonnes of maize to millers, industrial users and to Social Welfare Department. The Mission’s discussions with GMB at national, provincial and district levels identify major challenges. As a result of low crop production, it will be difficult for GMB to purchase adequate grain for distribution in the deficit ones. The capacity to import will be constrained by high world food prices and the availability of foreign exchange. In addition, Zambia and Malawi, two of the countries that have some surpluses have imposed export bans. Thus, the GMB plans to import substantial quantities of food maize and is unlikely to be achieved as indicated by past record. The GMB’s capacity to distribute grain from the district depots to the ward level will be further constrained by inadequate transport and fuel. The Department of Social Welfare (in the Ministry of Public Service, Labour and Social Welfare) has the responsibility to provide assistance to households who are vulnerable and in need. These include categories identified as chronically food insecure individuals: female-headed households, elderly-headed households, child-headed households; households with a disabled member and with chronically-ill members; households with orphans and vulnerable children; and destitute households. The Department implements two broad types of programmes: i) Public Assistance Programme (PAP) for able-bodied persons to maintain and rehabilitate roads and bridges, worth ZWD 250 million per day (ZWD 750 million per month). ii) Public Maintenance Programme (PMP) that targets vulnerable households valued at ZWD 10million per adult person per month. The PMP is intended for all categories of vulnerable individuals and covers assistance including food and medical care, among others. The value of the PMP payments have been severely eroded by inflation, with many households not receiving these services because the costs associated with accessing them (e.g. transport) were several times higher than the value of the transfers. When households received cash transfers, they were not able to adequately access the amount of grains as intended by the drought relief programme (one bag of maize) as the maize was not available in the depots and the transfer was not adequate for purchasing through the informal markets. It was reported at the provincial and district levels that the Department did not have the adequate capacity to respond to the unfolding situation of food insecurity. The World Food Programme is the largest food aid agency providing assistance in the country. WFP’s food assistance programmes in the country include vulnerable group feeding (VGF) which supports mobile vulnerable groups (MVP); orphans and vulnerable children (OVC); home–based care (HBC) and ART compliance programmes for people affected by HIV/AIDS, all of these falling in the chronic food insecurity category. It’s programmes include vulnerable group feeding (VGF); orphans and vulnerable children (OVC); home–based care (HBC) for people affected by HIV/AIDS, all of them falling in the chronic food insecurity category. CARE is the second largest, with it’s own food pipeline. Other agencies that have been working in the country recently include: Christian Care (in Gutu, Nkayi, Lupane, Chimanimani, Zvishavane, Mwenezi); CAFOD (in Binga, Chivi, Mutare, Nyanga, Bulilima and Mangwe); Lutheran World Federation (in Beitbridge and Zvishavane); Joint Initiative Multiple Agencies (on Urban Voucher System in Gweru, Masvingo, Harare and Bulawayo); World Vision Zimbabwe (in Lupane; IFRC/Zimbabwe Red Cross (in Chivi, Masvingo town, Mwenzi, Hwange, Nkayi, Beitbridge, Gwanda and Matobo); HELP Germany (working with HIV/Aids Patients on ARV treatment); Action AID (in Bulawayo, Harare and Makoni); and Integrated HBC CARE (in Zaka, Mwenzi and Mberegwa). Production decline has been the cause of acute food insecurity and provided the trigger for the CFSAM. The Mission established that households in Communal Areas were the most affected in rural province and districts. Household coping strategies play an important role in a household’s capacity to mitigate food insecurity. These options vary widely across geographic areas and by household socio-economic standing in both rural and urban areas. These coping strategies are important in the analysis of the final status of household food security situation. A sizeable proportion of households (10-15 percent) face chronic food insecurity by virtue of resource endowment and demographic composition including HIV/AIDS-related circumstances (these include OVC, elderly-headed households, chronically ill, etc.). Rural households who primarily depend on agricultural production will suffer a decline in food access as a result of poor household production, lack of physical access to food on the market and high food prices. Their capacity to cope will depend upon non-farm sources of income including remittances and wage employment. Urban and peri-urban households, primarily depending on formal and informal employment as their primary source of livelihoods, are likely to be affected by high food prices and the lack of physical access to food on the market. The first level analysis has been to identify populations that will be mostly affected. The field visits established that many farming households in communal areas harvested very little grains, likely to last only up to 3 months. Other farming households that were severely affected are newly resettled farmers whose food security situation was similar to households in communal areas. This broad picture of food insecurity was used to determine the number of persons most likely to be food insecure. The number of people living in communal areas is derived from the Mission population data (based on CSO figures) which categorised all wards in each district into farming categories (and has population data up to the ward level)., The number of persons was aggregated to the district level and the percentage of each district’s population in the high-risk category was also established. The district estimates were in turn aggregated to give provincial estimates (see Appendix 3). The second level analysis was based on verified total cereal production by district. Using population statistics for each district and per capita cereal consumption (133kg per annum of maize, sorghum and millet), the number of months that the cereal produced would last was computed for each district. This formed the basis for estimating months of cereal gap, and in turn for classifying districts as very severely food deficit, severely food deficit, moderately food deficit and self-sufficient. But this does not give the true picture of household level food insecurity in the districts. In short, aggregate availability does not equate to adequate household food access. Some districts that depend on livestock production (e.g. in Matabeleland South and Matabeleland North) have generally low production in normal years and hence a fall in cereal production would not translate into immediate food insecurity. The findings of this analysis are also presented as part of Appendix 3. The third level analysis focused on the livelihoods and coping strategies that households can draw upon to mitigate the food insecurity induced by the fall in production. The number of coping strategies and some weighing of their importance were used to compute an index that was then used in combination with the previous steps to determine the final number of the food insecure. In developing this index for coping strategies, livestock ownership and cash crops are regarded to be reliable and assigned greater weight than for instance gold panning, remittances, mopani worms, petty trade, etc. in that order. The index was based on information on coping strategies gathered through field interviews and from assessment reports for provinces and districts.5 These coping strategies in principle have been used to derive the extent to which food insecure households can expand their access to food and thereby reduce the months of deficit. In this case, it has been applied to adjust the number of persons from the first and second level analysis. These three levels of analysis were combined to generate the number of food insecure people at the end of the hunger period in March 2009. In the interest of transparency, detailed calculations based on these principles are shown in Appendix 3. The number of food insecure people, presented in table 11, was in turn used to estimate the quantity of food assistance required (see Table 12). The ZimVAC report established that food security had improved with 76 percent of the urban population being food secure in 2006 (good year) compared with 35 per cent in 2003 (a bad year). It is expected that the urban food insecure population in 2008/09 marketing season are likely to fall between these extremities. Based on the findings of these past assessments, actual numbers of food insecure persons will fall between the optimistic scenario of 884 000 in 2006 and a worst case scenario of nearly 2.4 million in 2003. In absence of significant imports, the number of the food insecure households in urban areas in 2008/9 could rise closer to the 2003 estimates. However, recent measures of liberalization of foreign exchange rate and suspension of import duties on essential commodities are likely to improve imports and overall supply of food in urban areas. Consequently, the Mission estimates that the food insecure could be around 40 percent of the urban population and a total number of 1 473 000 persons. The total number of food insecure persons in rural areas is presented by province in Table 11. The table shows 1 525 300 persons will be food insecure between July and September 2008, rising to 2 859 800 people between October and December 2008 and peaking to 3 813 000 people between January and March 2009. With an estimated 1 288 800 food insecure persons in urban and peri-urban areas, the total number of persons requiring assistance in the 2008/09 marketing season is estimated to reach 5 101 800 or approximately 45 percent of the total population. *This represents the number of persons shown under each period represent cumulative number of the food insecure to that period (e.g. for Jan-March 2009 this includes the total number of food insecure persons in the marketing year). *The requirement in July-Sept is for the food insecure in that period. The amount for Oct-Dec includes the combined need of the old and new food insecure, while Jan-Mar includes the needs of all those from earlier periods. Table 12 shows cereal requirements by time period, corresponding to the food insecure populations. The cereal requirement is based on a ration of 400g of cereal per day per person and supplies at about 69 percent of the energy requirement. This cereal ration was applied to the total number of persons in each period (July-September; October-December and January-March) and summed to give an aggregate of about 395 000 tonnes of cereal to be required for rural and urban households. Additionally, foods such as oil and legumes as well as supplementary foods may also be required to cover the needs of most vulnerable groups (children under five, the chronically ill, and, pregnant/lactating women). In-depth assessments will be required to fine tune needs and to guide programming and targeting of assistance. This will be especially crucial for urban areas where food insecurity issues are more complex. The food assistance will contribute to averting incidences of malnutrition, erosion of household and productive assets and saving lives. Food assistance should be targeted to reflect the situation of households – direct relief assistance, vulnerable group feeding (VGF), school feeding, or assistance to specific groups including orphans and vulnerable children (OVC) and mobile vulnerable households in rural and urban areas. While there were fears about unfolding food insecurity, some Government officials expressed the view that assistance should be in the form of the food-for-work (FFW) programme for households whose members are able to work. The underlying concern was that free food distribution could create dependency, undermining recovery efforts and labour availability on A2 and LSCA farms. The FFW approach is in line with the Department of Social Welfare’s public works programme. It is, therefore, recommended that this approach be considered where feasible, but without jeopardizing the food security of the most vulnerable. One of the challenges will be to reach all the segments of the food insecure population in remote rural locations. This will require coordination of activities by all stakeholders involved in humanitarian assistance delivery. The main Government institutions (GMB and Social Welfare) will need to work very closely with each other and with other humanitarian agencies to avert duplication of efforts and ensure efficient delivery of assistance. Regionally white maize for import into Zimbabwe is likely to be available mainly from South Africa as the latest official estimate indicates a potential exportable surplus of about 1.6 million tonnes. However, there are likely to be many African countries interested in buying this surplus. Hence early acquisition of maize imports by Zimbabwe would be necessary to ensure secure supplies. Other countries in the region are not likely to yield significant exportable surplus. This report estimates the national uncovered food gap (imported food aid) at 380 000 tonnes (shown in Table 9) and the food assistance needs of the food insecure people in the country at about 395 000 tonnes (shown in Table 12). There is no inconsistency in these figures. The difference of 15 000 tonnes is expected to be covered with local purchases primarily by GMB which would be intended for the vulnerable population. The national shortage is still a problem in the country and, therefore, external food aid is in part seen within the context of overall domestic availability. However, given that the lack of access to basic food because of declining purchasing power, assistance to the food insecure population is more determined by their household food gap than the national food gap in cereal production. Timely supply of inputs such as seeds, fertilizers, fuel, tilling services to farmers. Availability of seeds & fertilizers in the open markets so that those who can afford and wish to buy are able to do so. Improved access to credit all year round as and when farmers require funding. Promotion of home garden production especially in peri-urban and urban areas (i.e. information on inputs best use practices, making seeds available, etc.). Most households will strive to acquire food through other means as they can, including growing vegetable and other crops on irrigation schemes or in low laying wet lands. The Government and aid agencies should consider providing assistance (in the form of inputs) to expand this option to enable household to access food and incomes during the marketing year. Active promotion of the open pollinated varieties to reduce dependence on the imported hybrid seeds when not available. Conservation farming and good drainage management to limit the damage from and to take advantage of heavy rains. Strengthening the extension services especially with the means of transport and communication and computation. Extension services should be particularly focused on the newly settled farmers (A1 and A2). Soil fertility management with organic matter (farm yard manure, crop residue) to reduce dependence on scarce imported fertilizers. Access to credit (with examination of potential repayments tied to commodity produced to avoid inflation complications and negative real interest rates). Restoration of existing irrigation infrastructure. Urgent measures are needed to address food shortages in districts that have severe shortages to ensure that households with purchasing power can access food through markets. This can be attained through purchases from surplus districts but preferably through imports, since most districts have deficits. The Mission also recommends lifting restrictions imposed on private traders to carry out these functions as it is unlikely that GMB alone will meet this challenge. A significant strengthening of the Department’s capacity is needed at the delivery point to ensure effective provision of assistance to vulnerable households as well as the coordination of activities of their agencies providing assistance to affected populations. Significant external assistance will be required to address the needs of the affected population. It will be necessary for the Government to seek the support of the humanitarian community to augment its efforts in responding to the situation. Many humanitarian organizations (UN and NGOs) are already providing assistance in many parts of the country. Scaling of these operations will be needed to enable respond timely and effectively to the situation. The coordination of humanitarian assistance is of critical importance. This includes the exchange of information and in actual planning and implementing assistance programmes. The GMB and the Department of Social Welfare should work closely to take the lead, and work in close collaboration with WFP, CSAFE and other food agencies in the country. WFP and CSAFE have their own pipelines and sharing information on food availability, stocks and distribution plans will increase the efficiency of response and avoid duplication. Further, vulnerability assessment is recommended to fine-tune humanitarian assistance planning and targeting. Continuous and regular monitoring will be necessary to enable to adjust programming and the timely identification of deterioration of the situation. 1/ GMB prices are fixed through out the country, however, the local transport costs are not borne by GMB. Hence the effective prices do vary to its customers (sellers and buyers). GMB producer price was announced in early April 2008 at 22.6 billion/tonne, GMB selling price to millers and others is 5.3 billion/tonne, and to vulnerable people is 2.1 billion. In 2007 post-harvest GMB producer price was 4.2 m/t or about USD 140/tonne at parallel market exchange rate of ZWD 30 000/USD. 2/ A bucket of maize weighs about 17.5 kg. Manicaland: The greater part of the province is a high maize producing area, but productivity in the northern part is generally low. Cash crops such as tobacco, citrus fruits, bananas, apples, timber, tea and coffee are produced in the northern half where there are opportunities for farm labour on the plantation. The southern part is a dry lowland area with low productivity. Households supplement their incomes through livestock sales, casual labour, craft work and gold panning. Mashonaland East: The province has one of the most fertile lands in Zimbabwe and is suitable for intensive crop cultivation and livestock herding. Parts of the province rely on small grain production and cash crops including sunflower, cotton and tomatoes. Peri-urban communities grow horticultural crops to supplement income from formal employment. Coping strategies includes cash crop sales, vegetable gardening, causal labour and gold panning. Mashonaland Central: The province has one of the most productive communal lands, producing both food and cash crops. Maize is the dominant crop. However, the main sources of cash income include cotton, tobacco, sunflower, soya beans and sugar beans production. Employment on A1 and commercial farms is also an important source of livelihood. Poor households depend equally on their own crops, daily wages from casual labour, selling of sugar cane and gold sales to make ends meet. Mashonaland West: The main livelihoods include intensive crop cultivation and rearing of livestock. The main crops produced are maize, cotton and tobacco. Better-off households are generally self-sufficient in cereals; poor households depending on their own production and daily wages to make ends meet. There are also opportunities to work in the mine around the Great Dyke, fishing in Lake Kariba, gold panning and chrome picking. Midlands: Situated in the centre of the country, the province experiences dry spells in Natural Region III, resulting in variable production of maize, sorghum, groundnuts and limited millet. Livestock is more prominent in the other half of the lowland rural economy. Cash income is also derived from cotton, groundnuts, sweet potatoes and horticulture, as well as casual labour on commercial farms. The main coping strategies include gardening, petty trade, beer brewing, sales of curios and gold panning. Masvingo: Most of the land is suitable for both crop and livestock production. The main crops grown are maize and millet and also some lowland cash crops. Other crops that are grown include soya beans, sugar beans, groundnuts and sweet potatoes. Casual employment on sugar plantations provides an important source of cash income to buy food for the poor; better-off households (owning goats and cattle) sell livestock. Other coping strategies include beer sales, gold panning, remittances from migrant workers and peanut butter production. Matabeleland North: The principal livelihood activities in the province are crop production and livestock rearing. Formal employment is also found in the mines and on commercial farms. Fishing, wildlife, crafts and carvings are also important sources of income. Other sources of income include casual labour on commercial farms, brick moulding, hunting, selling livestock, vegetables and firewood and gold panning in some districts. Remittances from family members form an important part of the income. Matabeleland South: Livestock rearing and production of sorghum and maize are the main livelihood activities in this semi-arid province. Mopane worms are sold to supplement incomes of the poor. Poor households earn most of their cash income from farm labour in South Africa or on local commercial farms. Other sources of income include hunting of wild game, cross-border trading, gold panning, buying and reselling of vegetables, petty trade, selling livestock, cattle heading and remittances. This report has been prepared by Kisan Gunjal, Wondemagagne Shiferaw, Simon Dradri and Veronica Rammala under the responsibility of the FAO and WFP Secretariats with information from official and other sources. Since conditions may change rapidly, please contact the undersigned for further information if required. Please note that it now possible to subscribe to regional lists to only receive Special Reports/Alerts by region: Africa, Asia, Europe or Latin America (GIEWSAlertsAfrica-L, GIEWSAlertsAsia-L, GIEWSAlertsEurope-L and GIEWSAlertsLA-L). These lists can be subscribed to in the same way as the worldwide list. 1. FAO/WFP Crop and Food Security Assessment Mission Guidelines (revised recently and to be published on the FAO/GIEWS and WFP Web sites). 2. The Section is based on a variety of sources including publications and unpublished reports of FAO, UNDP, Government of Zimbabwe, and the Country reports of Zimbabwe by the Economist Intelligence Unit. 4. These include Masvingo, Gweru, Kadoma, Rusape, Bindura, Marondera, Ruwa, Chinhoyi, Karoi, Chirundu, Victoria Falls, Gwanda, Kwekwe, Redcliffe, Zvishavane, Shurungwi and Chiredzi. 5. It should be noted that the index was developed for each province, and therefore fails to capture observed inter-district variations in each province and inter-ward variation in each district.